Nottingham City Council and the Lawn Tennis Association (LTA) are looking for enthusiastic volunteers to help at the Open Nottingham Tennis tournament (8-16 June 2019). The team would like to hear from potential volunteers who will be 16 or older at the time the event takes place and free for a minimum of three days during the tournament. An interest in tennis, events and great customer care is also helpful. The deadline for volunteer applications is Sunday 17 February. In June 2019, the city will again host a week-long tournament at the Nottingham Tennis Centre. Having seen a sold-out finals weekend in 2018, the Nature Valley Open will combine a Women’s Tennis Association (WTA) International (celebrating its fifth year) with a men’s top level Association of Tennis Professionals (ATP) Challenger Tour event; attracting the stars of men’s and women’s tennis as they prepare for The Championships, Wimbledon. – Have fun and meet new people with the backdrop of a world-class tennis tournament! Volunteers can expect to undertake a mixture of roles including court stewarding, ticket checking and wayfinding. More specific roles include practice court supervisors, ‘Explore Wimbledon’ supervisors, merchandise stand supervisors, information point operators, participation assistants, buggy drivers and player services hotel assistants (off-site). The organisers aim to arrange individual timetables to offer a different role each day on site. This will offer a better, more varied tournament experience as well as the chance to work alongside lots of different people. There are some additional specific roles for which applicants can register an interest, later in the application process. Applicants may also be required to undergo an LTA Enhanced DBS check for specific roles. Volunteers should be available throughout the tournament from qualifying on 8 June through to the finals on 16 June. The minimum commitment is three days across the week. Days run from 9am-7pm (approximately, depending on the close of play). 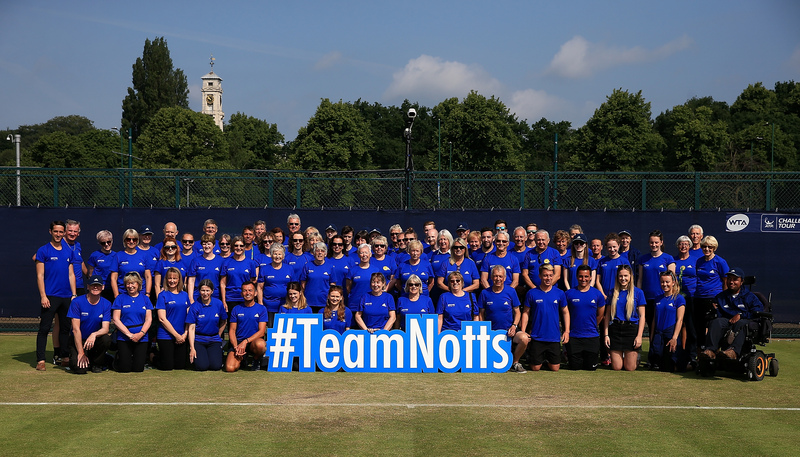 All successful applicants (new or returning) who are offered a role at the 2019 tournament will be required to attend a training session at Nottingham Tennis Centre on either Saturday 1 or Sunday 2 June 2019. Applications are now open! Find out more and download a role description by visiting: www.lta.org.uk/NottinghamVolunteers. If you have any further questions please email: TeamNotts@lta.org.uk.